To say that owning a dog that is fearful and aggressive is stressful is an understatement. Mix that stress with the existing disinformation about and stigma associated with muzzles, it’s no wonder the topic is emotionally charged. The Muzzle Up! Project aims to take the stigma out of muzzle use and provide quality, accurate information regarding dog behavior, training, and muzzle equipment – and debunk common muzzle myths along the way. One of these prevalent myths: If you muzzle your dog, you are putting your dog at risk because he will not be able to defend himself in the event of a fight with another dog. It’s understandable that dog owners are concerned for their dogs – after all, we strive to keep our dogs safe from harm and unpredictable environments. But this statement contains a large dose of myth and little to no fact. To understand why the above statement is a myth, we must understand why dogs fight and how often they choose to do so. Dogs evolved with a repertoire of aggressive behavior in order to: Protect themselves from perceived threats, get enough food to eat, and compete for resources. Due to domestication, dogs no longer need to compete for resources. They live with few environmental threats. However, they still retain this behavioral software from their ancestors, be it somewhat buggy in its domesticated form. Aggressive behavior is behaviorally expensive. For a dog in the wild, fighting exposes the animal to injury, wastes precious energy reserves, and could potentially end in death. As Jean Donaldson explains in her influential book Fight!, “Humans also appreciate the difference between filing a lawsuit and brandishing a machine gun. It is no different with animals: Because aggression is so expensive and yet so necessary, all kinds of rituals have evolved” (4). These rituals include growling, snapping, biting without maiming force, and snarling. The point in all of this is: Most dogs don’t fight with maiming force. The ones that do are a minority (and should be wearing a muzzle). Unfortunately, society has a skewed understanding of the prevalence of dog bites. The bites that do occur receive considerable attention, leading people to think that bites occur more often than they actually do. Bradley (2005) tackled this problem in her book Dogs Bite: But Balloons and Slippers are More Dangerous, concluding, “the reality now is that dogs almost never kill people, and they don’t actually bite very often, and when they do, we’re seldom injured, and when we are, it’s seldom serious” (30). Simply put, not muzzling a dog with a known bite history or behavioral issue out of fear of a dog attack is poor logic. If you own a dog, and that dog bites another dog or human and that bite gets recorded, your dog could be subject to dangerous dog laws. (And you could be subject to a costly lawsuit.) Your dog could be subject to loss of freedom and, in the worst case, euthanasia. For a summary of dangerous dog laws, read this article from The Whole Dog Journal. If your dog is fearful or aggressive, or has a known bite history, it’s imperative to protect him from becoming victim to these laws. A muzzle is your best line of defense. Instead of viewing your dog’s ability to bite as his protection against other aggressive dogs, what if you shifted paradigms? What if you had other, more effective tools that allowed you to protect your dog in the event of a fight? What if instead of relying on your dog’s ability to fight back, you prevented aggressive incidents from escalating? After all, very few dog fights are “fair,” given the variations in size, breed, temperament, and behavioral software. Adding your dog’s teeth to the mix isn’t going to make the outcome any more positive. – Carry citronella spray (for use only if a fight occurs). – Always carry high-value treats with you to keep your dog’s attention and potentially distract another non-aggressing off-leash dog. – Be aware of your environment so you can avoid other dogs, avoid getting “cornered,” and always have an escape route. – Find a force-free trainer to help you rehearse these techniques and feel prepared for real-life situations. Maureen is the founder of The Muzzle Up! 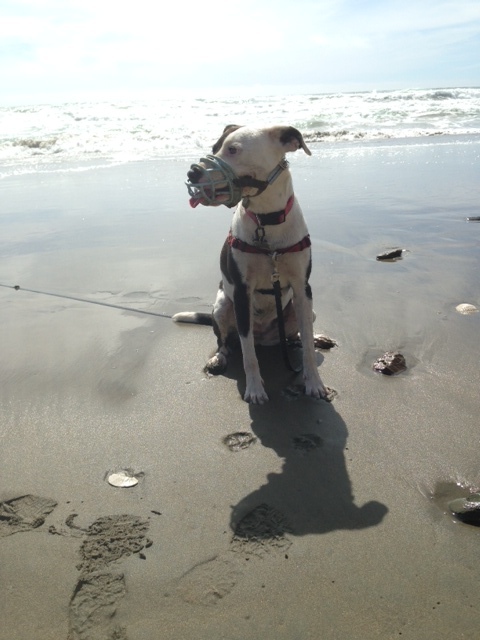 Project and owns Mutt About Town dog training in San Francisco, CA. Get in touch at muttabouttownsf@gmail.com.